Preheat oven to 425°F. Combine garlic powder, salt, and ground red pepper in small bowl; set aside. Place squash on baking sheet. Drizzle with oil and sprinkle with seasoning mix; gently toss to coat. Arrange in single layer. 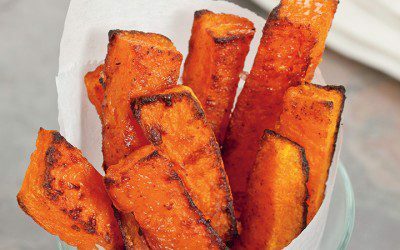 Bake 20 to 25 minutes or until squash just begins to brown, stirring frequently. Preheat broiler. Broil 3 to 5 minutes or until fries are browned and crisp. Spread on paper towels to cool slightly before serving. Exchanges per serving: 1 1/2 Bread/Starch, 1/2 Fat.